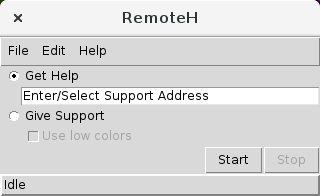 RemoteH is a program that allows to stablish reverse VNC connections. It allows to offer remote support in an easy way. It is a fork of Gitso, and like it, allows to remotelly share a computer's desktop using a reverse connection (which removes the need to open ports in the shared computer). It is great to offer remote support.